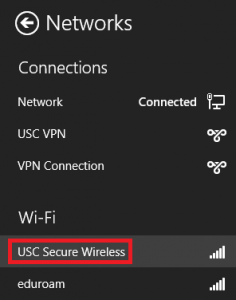 This page will explain how to connect a computer running Windows 8 or 8.1 to the USC Secure Wireless network. Press the Windows key and type connect to in the search field. Under Settings, click Connect to a network. The available networks will be displayed in the Networks window. Go to the Wi-Fi section and choose USC Secure Wireless. 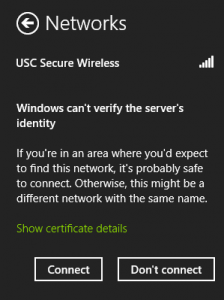 A screen stating “Windows can’t verify the server’s identity” will appear. 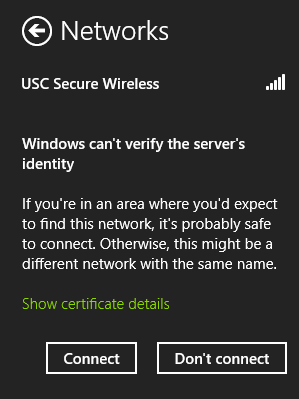 Click Connect to acknowledge this screen and connect to USC Secure Wireless.